Our ProTwin Head includes a Pro Magnum Reflector. 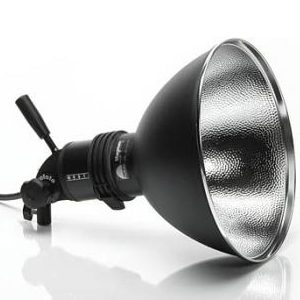 For even tougher demands, there is the Profoto ProTwin Head, that, using two flash tubes, effectively doubles the preformance of the ProHead. When used with a single generator, it produces shorter flash duration. Used with two generators, it achieves faster recycling and/or higher power, up to 9600 Ws. The Pro Magnum Reflector can be supplemented with the 10º Honeycomb grid.